CHICAGO – Corvette enthusiasts in search of a unique ride have much to consider this year with the introduction of two special-edition models: the Ron Fellows ALMS GT1 Champion Corvette Z06 and the Indianapolis 500 Pace Car Replica Corvette Convertible. The special-edition Corvettes are distinguished by unique interior and exterior appointments and will be offered in limited, pre-determined quantities. In other words, when they’re gone, they’re gone. The front fender graphics are reminiscent of the identifying graphics of the Corvette GT1 race car. They feature double Monterey Red Metallic stripes with Machine Silver borders and Fellows’ autograph in a contrasting Victory Red shade, along with the callouts of the championship years when he was at the wheel. There is also a maple leaf logo motif incorporated with the graphics, a nod to Fellows’ Canadian heritage. Indeed, the red-over-white color scheme of the car’s paint and graphics represents Canada's colors. An accomplished road racer, Ron Fellows is inextricably woven into the Corvette Racing team’s success. He helped test and develop the first Corvette C5.R race car and recorded the team’s first win in 2000. Fellows also grabbed the ALMS GTS class championship in 2002 and shared that position in 2003 and'04. Fellows has been a part of all six consecutive ALMS GT1 manufacturers championships for Chevrolet, and was voted the most popular ALMS driver in 2004 and'05. Additionally, he has slipped behind the wheel of NASCAR Nextel Cup Chevy Monte Carlo SS race cars when the series hits road courses. He’s also scored a pair of NASCAR Craftsman Truck series wins, three NASCAR Busch Series wins, 19 SCCA Trans Am wins and was the GM Player’s Challenge champion in 1989. 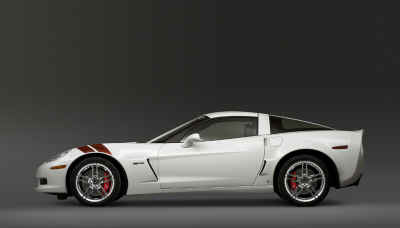 The Ron Fellows ALMS GT1 Champion Corvette Z06 will be available this spring. It carries an MSRP of $77,500, including destination. OnStar and the navigation system are the only options; and when equipped with them, the price is $79,945. A 2007 Chevrolet Corvette convertible will pace the 91 st running of the Indianapolis 500 on May 27, 2007. 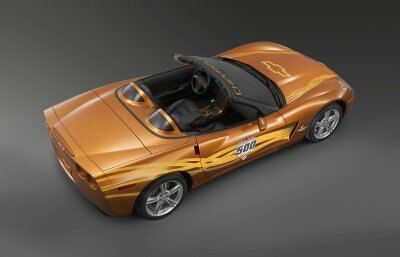 As it was selected as the Official Pace Car, Chevrolet will supply several identically prepared and uniquely trimmed Corvette convertibles – in new Atomic Orange paint with distinctive gold ribbon graphics – that will serve in the official pace duties of the race, as well as supporting activities. Five hundred production replicas of those official cars will be offered to the public – all of them convertibles. They’ll be available beginning this spring. All of the pace car replicas are equipped with the Corvette’s standard LS2 small-block V-8 and Z51 performance package. A six-speed manual transmission is standard, with the six-speed paddle-shift automatic optional. The navigation system with Bose audio, as well as OnStar, is standard. Pricing for the pace car replica convertible is $66,995 MSRP, including destination. The paddle-shift six-speed automatic is the only option, which brings the price to $68,245. The performance-bred Corvette handles its official pace duties in nearly factory-stock trim, with little more than race track-required safety equipment and strobe lights added – as well as, of course, the eye-catching graphics. In years past, many Indy pace cars required extensive modification to perform their on-track tasks. The 2007 Corvette’s powertrain and suspension, including the 400-horsepower (298 kW) LS2 small-block V-8 engine, are more than adequate to maintain the speed, acceleration and handling required to lead the pack around the famed “Brickyard” race track. This year marks the ninth time Corvette has served as the Official Pace Car of the Indianapolis 500. The previous years were 1978, 1986, 1995, 1998, 2002, 2004, 2005 and 2006. It also is a record fourth consecutive turn for the Corvette, as well as a record 18 th time for a Chevrolet, to be selected as the pace car. Production replicas were not offered every time the Corvette was selected as the pace car. In fact, 2007 marks the first time Chevrolet has offered a regular-production replica since 1998. But along with the regular-production models, several dozen copies of all the pace cars have been used for official activities in support of their respective Indianapolis 500 races, such as parades. These cars – known as “festival” cars – have become prized collectibles, along with the limited-edition regular-production replicas. * Horsepower and torque are SAE certified. A new voluntary power and torque certification procedure developed by the SAE Engine Test Code committee was approved March 31, 2005. This procedure (J2723) ensures fair, accurate ratings for horsepower and torque by allowing manufacturers to certify their engines through third-party witness testing. GM was the first auto manufacturer to begin using the procedure and expects to use it for all newly rated engines in the future.